Crowdfunding science: Were giant tyrannosaurs cannibalistic scavengers? Did a large tyrannosaur called Daspletosaurus nosh on the dead bodies of members of its own species? Vertebrate paleontologist David Hone wants to use crowdfunding to find out. Paleontologists originally thought tyrannosaurs—like the species Tyrannosaurus rex and its smaller cousins of the genus Daspletosaurus—fed by preying on other species, according to a blog post by Hone. After all, their huge skulls with giant sharp teeth sure make them seem like terrifying predators. But starting in the 1980s, another hypothesis entered the scene: perhaps tyrannosaurs were too slow to chase down all their calories. Perhaps tyrannosaurs were also scavengers. Dr. Hone and his collaborator found support for this idea when they discovered teeth marks on the arm bone of a prey dinosaur. The rest of the dinosaur—which was likely buried in sand at the time—was untouched. A new question emerged: would a scavenging tyrannosaur eat one of its own? The Royal Tyrrell Museum in Alberta, Canada is home to a unique Daspletosaurus skull. At 26 feet long and two tons (about the size of a large moving truck) Daspletosaurus was a giant carnivore and could easily eat an adult human in a bite in a half (if they and we had coexisted). This particular skull is unique because it has bite marks on it, and these bite marks look like they are from another large carnivore. In fact, they look suspiciously like they could have come from a tyrannosaur. But in order to know for sure, Hone needs to study the skull. Hone is looking to crowdfund this project. 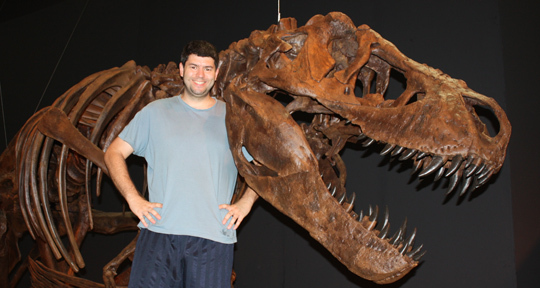 His goal is to raise $5000 to support his travel and lodging while studying the Daspletosaurus skull at the museum and to publish the results in an open access journal (check out this webinar to learn more about crowdfunding science). Several artists have also joined the effort, which means you can buy cool dinosaur gear and support science! I don't know what the future holds for crowfunding scientific research, but I think this is a great example of a project well suited to the model. It is relatively small in scale, easy to understand, and captivates the imagination. Check it out.